Federalist No. 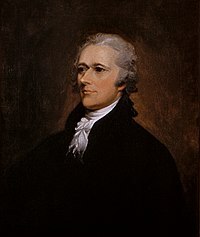 84 is a political essay by American Founding Father Alexander Hamilton, the eighty-fourth and penultimate essay in a series known as The Federalist Papers. It was published July 16, July 26, and August 9, 1788 under the pseudonym Publius, the name which all The Federalist Papers were published. The official title of the work is "Certain General and Miscellaneous Objections to the Constitution Considered and Answered". Federalist 84 is best known for its opposition to a Bill of Rights, a viewpoint that the work's other author, James Madison, disagreed with. Madison's position eventually won out in Congress and a Bill of Rights was ratified on December 15, 1791. I go further, and affirm that bills of rights, in the sense and in the extent in which they are contended for, are not only unnecessary in the proposed constitution, but would even be dangerous. They would contain various exceptions to powers which are not granted; and on this very account, would afford a colorable pretext to claim more than were granted. For why declare that things shall not be done which there is no power to do? Why for instance, should it be said, that the liberty of the press shall not be restrained, when no power is given by which restrictions may be imposed? I will not contend that such a provision would confer a regulating power; but it is evident that it would furnish, to men disposed to usurp, a plausible pretense for claiming that power. Hamilton continued in this essay on defending the notion that a bill of rights is unnecessary for the Constitution when he stated, "There remains but one other view of this matter to conclude the point. The truth is, after all the declamation we have heard, that the constitution is itself in every rational sense, and to every useful purpose, A BILL OF RIGHTS. The several bills of rights, in Great-Britain, form its constitution, and conversely the constitution of each state is its bill of rights. And the proposed constitution, if adopted, will be the bill of rights of the union." Hamilton’s argument is ultimately that a bill of rights should not be added to the Constitution, because the entire Constitution is in itself a bill of rights. Hamilton's belief is that the entire document, U.S. Constitution, should set limits and checks and balances on the government so that no individual’s rights will be infringed upon. ^ Hamilton, Alexander (2009). The Federalist Papers No. 84. New Haven: Yale University Press. p. 435. This page was last edited on 13 April 2019, at 01:03 (UTC).